No one will dispute that an organisations biggest asset is its people and there is a vast array of evidence to demonstrate that when organisations create great workplaces, people thrive and success follows. Good organisations strive to create even greater places to work and all have something in common, they listen to their people and act on the feedback. Harris Interactive is a market leader in research and digital solutions without the technical limitations of many agencies – in fact, we encourage innovation as it’s what helps us keep our clients ahead of what’s next. We leverage this to develop employee research solutions that can span the whole employee lifecycle, from ongoing research with real-time reporting to the big annual survey. Most of our research centres around employee engagement using our validated active engagement model. It’s great when employees are engaged, but it’s even better when they are fully engaged. There is a huge amount of debate about how organisations should be listening to their people such as always on, pulse surveys and there is even the suggestion that the annual survey is dead. What matters is that organisations listen in the most appropriate way for their size, where they are in their engagement journey and their ability to mobilise in response to survey feedback. We’re here to help you find the right listening solution, the right frequency and the right digital reporting solution. Speak to one of our experts today to see how Harris Interactive can keep you ahead of what’s next! 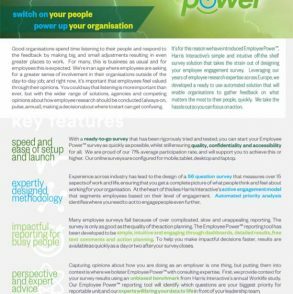 Employee Power™ has been developed to simplify and automate employee survey creation, data collection, reporting, benchmarking, and action planning. Vijay joined Harris Interactive as the Head of Employee Research in February 2018. 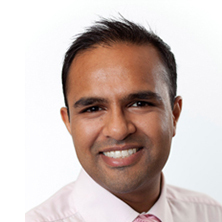 Acquired over his 10-year career as an employee research specialist in the UK and Middle-East, Vijay brings with him a wealth experience from working with some of the most recognisable brands and organisations across the public and private sector. His experience and expertise spans the employee lifecycle; with specialist knowledge of employee engagement, organisational culture, change management and inside-out customer experience. Vijay is a strategic thinker, challenging organisations through insight and in the design of their programmes to do more and get more out of their research.